This dramatic work was written to commemorate the 25th anniversary of loss of the Edmund Fitzgerald and her crew, and to honor the men and women who work in the maritime and great lakes' freighting industries. The reasons why the Edmund Fitzgerald so draws our interest are: First, she was the greatest ship on the Great Lakes, a fine captain and crew, and at the time of year notorious for such storms, they were thrown against a beast of a storm on a lake with an unforgiving reputation. Second, stories where human endeavor must stand against nature satisfy our need to understand our environment. Last, since many questions remain unanswered, we also have a mystery that leaves us profoundly disturbed. The Fitzgerald displaced 13,632 tons and was 729 feet long. In 1958, when she was first launched, she was the largest carrier on the Great Lakes, and remained so until 1971. The Fitzgerald was labeled "The Pride of the American Flag". In 1964 she became the first ship on the Great Lakes to carry more than a million tons of ore through the Soo Locks. On November 9, 1975 she departed from Superior, WI with approximately 26,000 tons of ore bound for Detroit MI. Shortly after leaving, the Fitzgerald made contact with the Arthur M. Anderson bound, on a similar route, for Gary IN. The title is based on the final words uttered by Captain McSorley to the Anderson crew before the Fitzgerald disappeared beneath the surface. We have all heard the Gordon Lightfoot song about "The Wreck of the Edmund Fitzgerald" that tells the tale of that fateful night and now, Lake Superior Theatre gives us the opportunity to contemplate this tale of courage and hope right on the shores of one of the largest bodies of freshwater in the world, Lake Superior. Late on the afternoon of the 10th, the captain of the Fitzgerald made radio contact with another ship, the Avafor, and reported that they "had a bad list, had lost both radars, and was taking heavy seas over the deck in one of the worst seas he had ever been in." Captain McSorely was a seasoned sailor of the Great Lakes with 44 years of experience. The storm that hit when the Fitzgerald went down was one of the biggest, and the worst that Captain McSorley said he had ever seen. In the Fitzgerald's storm, winds as fast as 45 knots were reported, with waves as high as thirty feet. 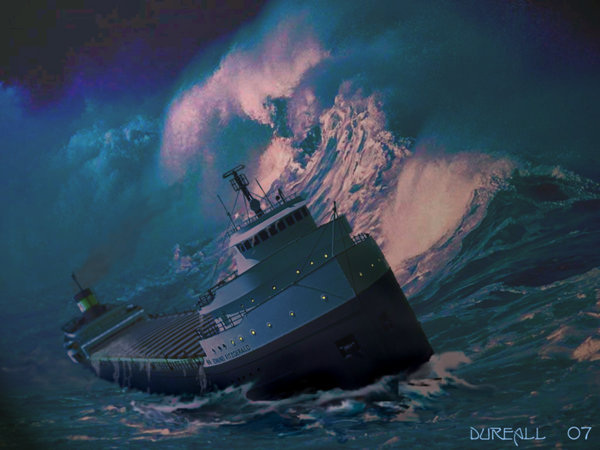 Both water pumps on the Edmund Fitzgerald were damaged, and the lifeboats were destroyed by the force of the storm. "...At seven p.m. a main hatchway caved in he said 'fellas it's bin good to know ya' The captain wired in he had water comin' in and the good ship and crew was in peril and later that night when 'is lights went out of sight came the wreck of the Edmund Fitzgerald"
The Edmund Fitzgerald was lost with her entire crew of 29 men on Lake Superior November 10, 1975, 17 miles north-northwest of Whitefish Point, Michigan. The ship's bell, which was attached to the roof of the pilothouse, was unanimously selected to serve this important purpose. 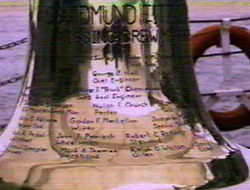 Further, it was suggested that a replica bell, inscribed with the names of the lost crewmen, be placed on the wreck as a permanent grave marker.